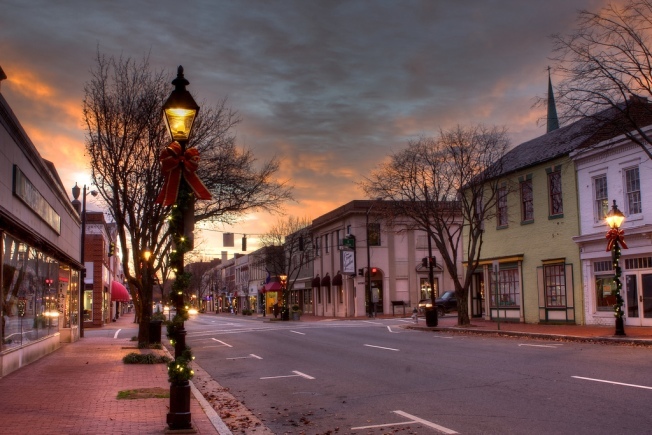 The historic town of Fredericksburg, Virginia is never short on holiday cheer. Join in on the many cheery festivities happening this month and beyond. Jingle Bell Christmas Carriage Rides: Now through Jan. 3, you can ride through Fredericksburg’s 40 blocks of historic neighborhoods, where you’ll see the quaint cobbled streets and picturesque architecture. Travel down Caroline Street to see the decorated store windows, past Kenmore Plantation, down Washington Avenue and then wind your way past Fredericksburg's official Christmas Tree. Breakfast with Santa at Eileen's Bakery: Three Sundays, Dec. 7, 14 and 20, offer the chance to enjoy a breakfast buffet with an area set up for the kiddos to decorate their own pancakes. Seating times are 8:30 a.m. and 10 a.m. Each child will have a personal visit with Santa and receive surprise gift. Fredericksburg Christmas Parade: On Saturday, Dec. 6 at 5:30 p.m., more than 90 floats from community groups will take to the streets for the annual downtown Christmas parade. The parade begins at the Visitor Center in the 700 block of Caroline Street and winds its way up to the 700 block of Princess Anne Street. Spotsylvania Courthouse Luminary: On Sunday, Dec. 7, more than 500 luminaries will be placed on the courthouse lawn, accompanied by music provided by local chorus groups. Sip hot cocoa at this free event which takes place from 4:45 p.m. to 6:30 p.m. Dress for cold weather and bring a blanket or chairs. Annual Spotsylvania Christmas Parade: On Saturday, Dec. 6, this frozen wonderland will take over the historic courthouse district starting at 1 p.m. Expect to see fire trucks, antique cars, horses, floats and of course, Santa Claus. Holiday Night Walk: On Saturday, Dec. 20, stroll through Fredericksburg while enjoying the lights and sights of the holiday season. Walk at your own pace along three- or six-mile trails. A cookie checkpoint will offer hot drinks and homemade cookies. Start between 3 and 5 p.m.; the free event finishes by 8 p.m.
Potomac Point Winery Open House: On Saturday, Dec. 6 from 2 p.m. to 5 p.m., Potomac Point will be offering up to 20 percent off wine and gift shop merchandise. Sampling their signature wine grog and shop ready-made gift baskets. You'll also find live holiday music and a visit from Santa. Fredericksburg is about 54 miles south of downtown D.C.